Google Play Music All Access is a new monthly music subscription service that lets you listen to millions of songs across your devices. You can create a radio station from any song or artist you love, browse recommendations from our expert music team or explore by genre. And when millions of songs just aren’t enough, Google Play Music lets you combine our collection with your own collection. You can store 20,000 songs for free in the cloud and listen to them alongside the All Access catalog. 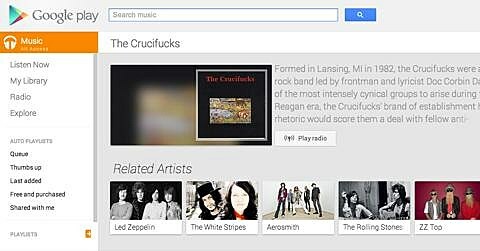 Google Play Music’s All Access promises “millions of songs” (but none by The Crucifucks) runs $9.99 a month, but if you sign up before June 30 you get a discounted rate of $7.99 a month. You can try it for a month for free. There’s a Pandora-like radio too, but no free-with-ads version like Spotify, however.